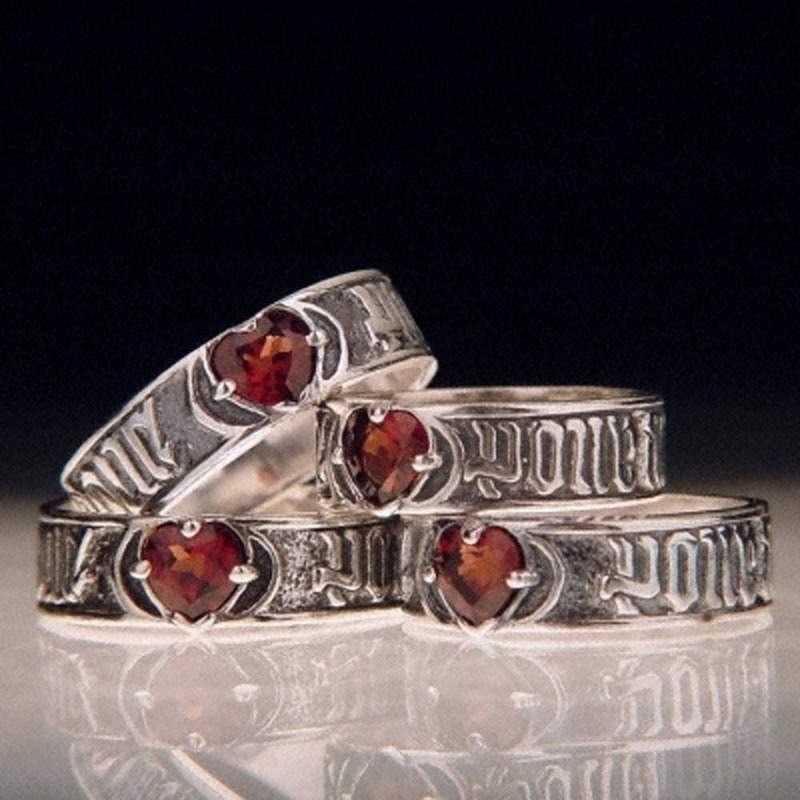 These rings are cast in sterling silver using the lost-wax method and are hand finished with a hand set semi precious garnet stone. In the 16th and 17th century England and France, a wedding ring would invariably be inscribed with a sentiment of love, faith and hope. A silver betrothal ring would often be replaced with the same poesy ring in gold on marriage. They reached their greatest popularity historically during the Renaissance when they were not only given as wedding rings, but used as a lover's token or simply as a means of showing fond regard or giving a gift. Many of Shakespeare's plays mention them such as Hamlet Act III, scene 2, "Is this a prologue or the poesy of a ring." Sterling silver will retain its luster for years and frequent wearing of your jewelry will help prevent tarnishing. We recommend polishing your sterling silver jewelry with a dry silver polishing cloth available at most grocery or hardware stores. We do not recommend polishing with silver polish as this may remove the antiquing. When you are not wearing your jewelry, storing your silver in a jewelry bag will help prevent tarnishing.